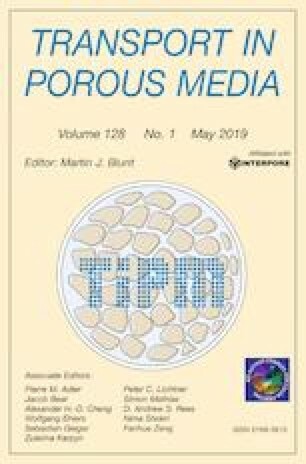 A mathematical model is developed based on the empirical power law equation for post-laminar flow through porous media. Hydraulic conductivity and the critical Reynolds number are used as boundary conditions. The developed model can predict hydraulic gradients for specific velocities, irrespective of the media sizes or porosities, over the complete flow transition. Therefore, the model can be very useful to recognise the specific flow regime or to predict the velocity and hydraulic gradient for a given flow regime. A parametric study is carried out concerning the behaviour of binomial (Forchheimer) and power law (Izbash and Wilkins) coefficients subjected to different media sizes, porosities and flow regimes. The observed behaviour of Forchheimer and Izbash coefficients with different media sizes and porosities are similar to the experimental results reported in the literature. However, the values of these coefficients differ when subjected to different flow regimes for any specific packing. The ratios of non-Darcy and Darcy coefficients of the Forchheimer equation suggest an increasing influence of inertia towards the turbulent regime. The maximum and minimum values of β are found to be 1.38 and 0.69 for laminar and turbulent regime, respectively. However, these values are found to be unaffected by the media size and porosity variation. The value of Wilkins coefficient w in the laminar regime is found to be 4841.72 for all media sizes and porosities. However, the coefficient represents a decreasing variation trend towards the turbulent regime which is also dependent of the media size variation. The authors would like to thank the authorities of IIT (ISM) Dhanbad for their support and in utilising the facilities in various departments. The authors would also acknowledge the funding received from IIT (ISM), Dhanbad under MRP and FRS projects for fabrication of the permeameters, procurement of fluid, media and other accessories utilised for experimentation and investigation. Step 3 Insert the hydraulic conductivity (K) of the given packing. Step 10 Plot calculated velocities and hydraulic gradients to get the variation trend of velocity with hydraulic gradient in a specific flow regime for a given media size porosity.